Simone Enea first appears in the Painesville, Ohio, area between 1909 and 1917. In America, he was known as Samuel Enea. Simone Enea, son of Gioacchino Enea, was born on November 29, 1894, at Palermo, Sicily. He married Augustina Jeffries, daughter of Domenico Giuffre and Angela Urso, about 1919. Simone died on June 5, 1944, at Bellevue Hospital, New York City, New York, at age 49. Simone Enea immigrated to the United States on August 13, 1909, at age 14, travelling to Pittsburgh, Allegheny County, Pennsylvania. He was joining his father, Gioacchino Enea, in Pittsburgh. 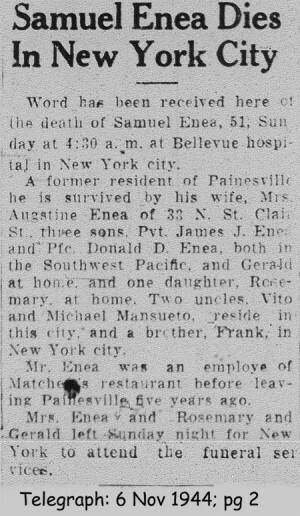 Simone Enea became a citizen of the United States on June 18, 1928.Simone resided at 344 North St. Clair Street, Painesville, Lake County, Ohio, when he was naturalized. Simone had two uncles living in Painesville: Vito Mansueto and Michele Mansueto. 1. Rose Natale Enea was born on December 25, 1919, at Painesville, Lake County, Ohio. Rose died on February 15, 1920, at North St. Clair Street, Painesville, Lake County, Ohio. Her body was interred at St. Mary Cemetery at Painesville Township, Lake County, Ohio. 2. James J. Enea was born on June 16, 1921, at Ohio. James died on January 10, 1984, at age 62. His body was interred at Perry Center Cemetery at Perry, Lake County, Ohio. 3. Angeline Dorothy Enea was born on September 2, 1923, at Painesville, Lake County, Ohio. Angeline died on October 28, 1923, at 418 North St. Clair Street, Painesville, Lake County, Ohio. Her body was interred at St. Mary Cemetery at Painesville Township, Lake County, Ohio. 4. Mary Jean Enea was born on March 13, 1925, at Painesville, Lake County, Ohio. Mary Jean died on March 30, 1925, at 418 North St. Clair Street, Painesville, Lake County, Ohio. Her body was interred at St. Mary Cemetery at Painesville Township, Lake County, Ohio. 5. Donald Enea was born on September 16, 1926, at Painesville, Lake County, Ohio. Donald died on December 17, 2000, at LakeEast Hospital, Painesville, Lake County, Ohio, at age 74. His body was interred at Riverside Cemetery at Painesville, Lake County, Ohio. 6. Marie Enea was born about 1929, at Ohio. 7. Gerald F. Enea was born in 1931. Gerald F. died in 1997. His body was interred at Perry Center Cemetery at Perry, Lake County, Ohio.